Early in his excellent bestseller on the history of mankind, Sapiens author Yuval Noah Harari makes an observation that chimes so forcibly with this week’s review car that I just felt I had to mention it. He brilliantly outlines how quickly we shift from regarding something as a luxury to it becoming an everyday necessity, an imperative that takes disproportionate priority in our hierarchy of needs and expectations. Like not being able to start the day without that expensive coffee or turning up our noses at bargain plonk after growing accustomed to an excellent vintage. Without doubt, the same applies to cars: we want bigger, better and more all the time. Automakers respond to, and stoke, demand. Some of the excesses – in the options list particularly – still astound. Every time I’m exposed to the latest extreme creature comfort, I wonder: what next? I remember when perforated luxury leather seats that blew air-conditioned air around your nether regions were viewed as an ultimate. Now? It’s expected in most luxury cars. 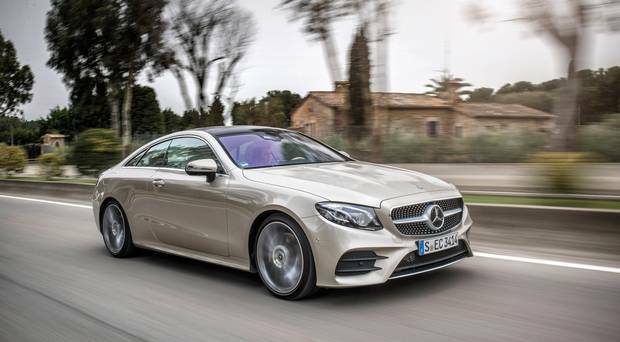 The Mercedes E-Class Coupé I’ve just been driving reserves large portions of its exotica for the technological arena within its substantial frame. Yet it has swathes of ‘comfort’ stuff I’m not mentioning – because I expect them to be there. But even though it pampered me with two-tone Classic red-and-black nappa leather, for example, it still left areas exposed to criticism on the basis of my greater expectations. Contributing to my sense of anticipation were its prime visuals: chrome flat-diamond grille (gorgeous) out front, two fixed-tailpipe exhausts, sloping roof, twin-screen display, a smattering of AMG-Line touches, 20ins AMG-Line multi-spoke alloys (the air-vents across the top of the dash seemed to mirror them) and so on. Before pressing the start button, I said to myself: this is going to be something special. It was. And it wasn’t. Before telling you why, let me give you a quick bit of E-Class Coupé background. It is based on the excellent saloon, though it’s 10cms shorter and 50mm lower. It is quite a departure visually from the saloon and estate but retains – and I’ve tested this – enough rear-seat room for two adults despite being a 2dr. The front doors make it easy to access the rear but they are heavy, long and awkward to push from inside because – and this applies to lots of cars – the pivotal point is far behind the handle one uses to open. So you use your elbow and risk the car opening too wide/quickly, risking damage to another. The double-screen/interactive display stretches across the dash for ease of use, giving near-cinematic views of what’s going on. And powering everything was the brand new 2-litre (1,950cc) 4cyl 194bhp diesel. I’ve really liked that diesel in the saloon and estate but it didn’t sound nearly as quiet in this. It was a good deal ‘clankier’ on starting than I expected because the previous two were much quieter. Better noise suppression required, maybe? My test car had Agility Control suspension. It is supposed to let the car’s dampers match the road conditions. I’m sure it did, but the presence of 20ins wheels on low-profile tyres countered many of the benefits I suspect. I expected better and felt this was the most disappointing part of my drive. I used Sport and Sport+ mode for general driving because I felt the car didn’t have the equilibrium of previous extensive tests in the saloon and estate. Again, my expectations were for a better-quality ride, especially over moderately poor roads. I blamed the tyres, mostly. I have to, because previous models never troubled in that area. I suppose the current ultimate expectation is a car that can ‘drive itself’. This can – for lengthy stretches, too. I’ve done Dublin-Belfast; Dublin-Wexford; Dublin-Offaly in an E-Class and Dublin-Cork in a BMW 520d. On this test, I found it changed lanes – when safe – when I used the indicator. It didn’t do that in previous drives. The ‘autonomous’ drive is a wonder and this time it exceeded my expectations. That’s partly due to greater familiarity, I’d say, and an acquired sense of when to intervene (no, it’s not faultless). And so, the overall impression is one of reality catching up with expectations for many good and some bad reasons. It is a lovely car – what a wondrous cabin and what extraordinary technology. It remains a firm favourite and a prime example of what can be achieved on four wheels. But there were areas where my expectations exceeded its ability to deliver. Mr Harari was spot on in Sapiens: we are never satisfied. Mercedes E-Class E220d 2dr Coupé AMG-line 8spd auto; 1,950cc, 194bhp, diesel, 119g/km, €200 road tax, claimed 4.6/4-litre/100km (6l/100km on test). Standard spec: leather red/black upholstery, heated seats, park assist, rear-view camera, satnav, Agility Control suspension, 66-litre tank, AMG bodystyling, Artico beltlines/door panels/armrest, ambient lighting, AMG bodystyling, two fixed-tailpipe system. Options add 20ins AMG alloys, panoramic sunroof, driver assistant package, multi-beam LED lights, etc. Price: from €53,690; Options: €18,367. Total: €72,057.